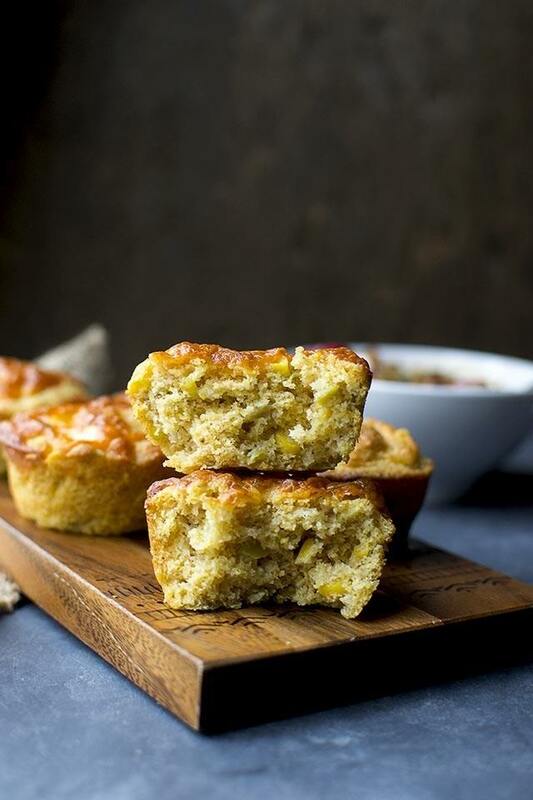 These cornbread muffins are just perfect -- not too sweet -- but moist and absolutely delicious. They have whole corn stirred right into the batter. Preheat oven to 400°F. Lightly grease a muffin pan or line them with paper liners. In a mixing bowl, whisk cornmeal, wholewheat flour, all purpose flour, sugar, baking powder, salt and chili powder. In another mixing bowl, combine egg replacer mixture with the milk and oil. Stir in the corn kernels and all but 2tbsp of the chilies. Add the wet ingredients to the dry ingredients and mix just until evenly moistened. Stir in ½cup of the grated cheese. Divide the batter evenly into the prepared pan and sprinkle each muffin with 1tsp of the remaining cheese and ½tsp of the reserved chilies. Bake the muffins until a toothpick inserted into the center comes out clean, about 20 minutes. Remove from the oven and allow the muffins to cool in the pan for 5 minutes, then turn them out onto a wire rack to finish cooling.